>Chez Carey! Variations on Mom’s Pasta and veggie dish. My mom used to make something like this for me when I was a kid and It’s still one of my favorite go-to dinners. Loaded with veggies, it’s a great way to get a ton of nutrients in one meal. It’s grown up slightly, with whole wheat penne and chopped peperoncini, but for the most part it’s still a comfort food for me. This version is super healthy; using cooking spray instead of oil, way more veggies than pasta and just a finishing sprinkle of Parmesan. You can feel free to vary the veggies, but this is my favorite combo. Prep all of your ingredients first. Cook the pasta while you do the following. Spray a pan with cooking spray and saute some minced fresh garlic and shallots. Add mushrooms, carrots, brussels sprouts and yellow squash and continue sauteing, add in shredded radicchio and toss a couple of times. Stir in chopped sun-dried tomatos and chopped peperoncinis. Add 1/4 cup of white wine and half a cup of chicken broth and bring to a boil. Stir occasionally as the liquid evaporates. 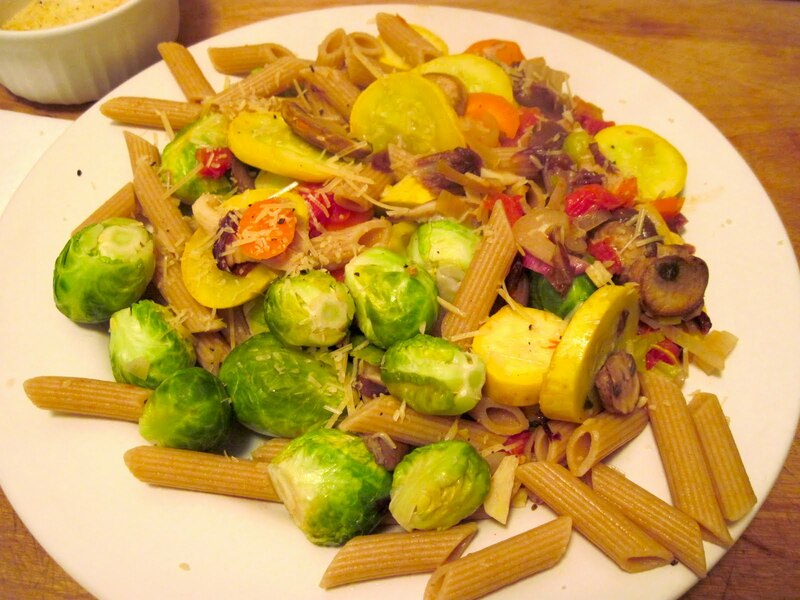 When the brussels sprouts are tender, add the drained pasta and toss. Top with shredded Parmesan and enjoy!